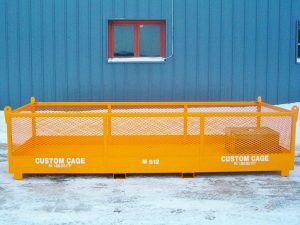 Welcome To Lakeshore Industrial, Inc.
Lakeshore Industrial, Inc. manufactures personnel lifting platforms, Manbaskets / Man Baskets under the trade name Custom Cage®. These work platforms are available in a wide variety of dimensions and capacities. They are designed to be suspended directly from a crane hook or attached to a forklift. Custom Cages® are certified to meet or exceed all existing state and federal codes. Each cage is load tested prior to shipping. 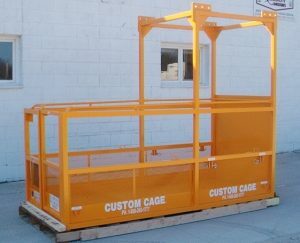 Custom Cages® are available in any size, shape or material to meet your needs. Lakeshore Industrial, Inc. builds the highest quality industrial platforms / manbaskets made. We are dedicated to building personnel manbaskets for cranes and fork trucks. Custom Cage® Think Safety! 48” x 48” x 86” W.L.L. 1,000 lbs. Shown with optional Test Weight, Peaked Solid Steel Roof, Forklift Attachments, and Rubber Corner Bumpers. Welding procedures, all welds are spatter free and smooth. Dimensions: 48″ W. x 108″ L. x 86” H. with 5′ work area @ 44″ high beyond pick point. Working load limit; 900 lbs. overall – 500 lbs. w.l.l. on deck beyond pick point. Easy on/ off detachable Test Weight system (1,125 lbs.) evenly distributes 125% test load on platform frame. Five part bridle assembly w/shackles 4 legs of 5/8” wire rope 2 legs @ 5’ and 2 legs @ 6’ and 5th leg ¾” wire rope @ 6’ attached to master ring dedicated for personnel hoisting only. Forklift tubes for easy transporting from one location to the next (6”x3”x1/8”). Finish – Electrostatic powder coat (Color: Safety Yellow). Meets or exceeds A.S.M.E. B30.20-latest specifications. Working load limit 5,000 lbs. Sides enclosed with expanded metal. 4 Attachment points for cable suspension. Fork pockets (7”x3”x3/16”) for transporting with fork truck. Heavy Construction steel material baskets available in any sizes. 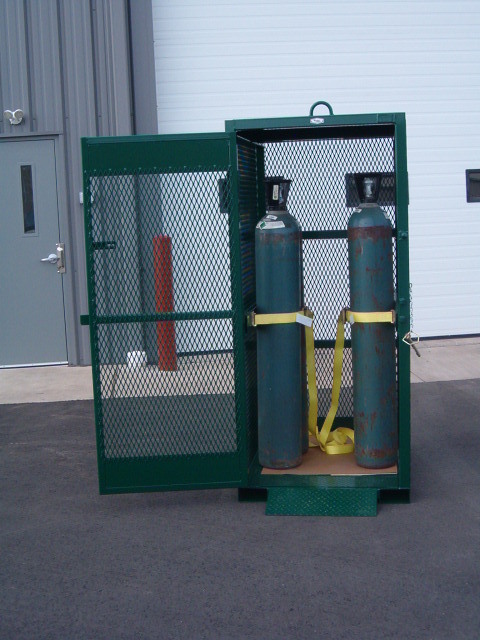 Designed to meet or exceed all State and Federal OSHA Regulations. Two year warranty. * Dimensions: 44” x 34” x 75” high outside. Solid steel roof with a Single pick point. Outward swinging lockable gate on one side with drop pin latch. Ramp below gate for easy loading of your cylinders. Finish – Electrostatic powder coat finish – safety green. Designed to meet or exceed OSHA 29 CFR Subpart CC Part 1926.1431final rule, and WCB & CSA Standards. Attachment points for bridle assembly.